This page lists commonly used terminology for various blaster components on a pressurized reservoir-based blaster. 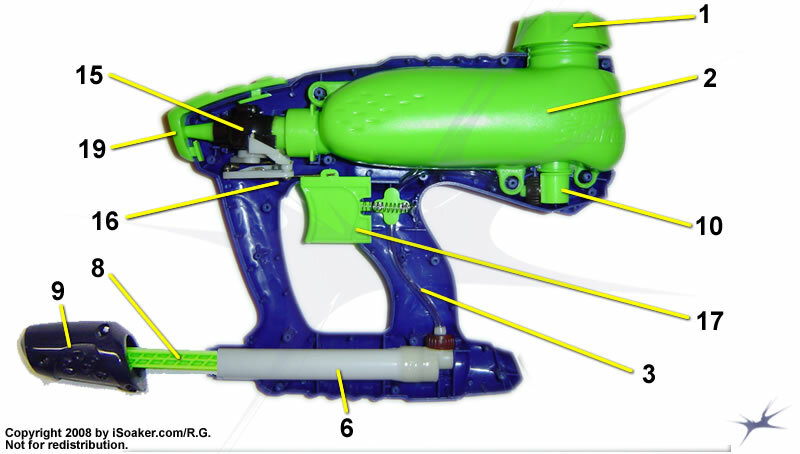 While the image here is of a Super Soaker Liquidator, many common water blasters share similar parts layouts internally. While not all blasters have all the parts shown and while other blasters may have additional components, the name list together with the diagram should help those newer to water blaster internals identify specific parts and make sense of the various repair guides that make use of these terms. Parts as indicated by the numbered yellow lines.